Chicago's a wonderful city and one of the things I enjoy during the summer is attending 'Movies in the Park.' The Chicago Park district hosts an outdoor film every Tuesday for a few weeks during the summer and attendees come with picnic baskets, folding chairs, blankets, and games to enjoy before the movie starts... think picnic tailgating before the main event movie! This was the last 'Movies in the Park' event of the 2009 summer season and the movie of the night was Tootsie. If you haven't watched this movie, you must! It has all the great things about the 1980's - cheesy love ballads ("It Might Be You"), feathered hairstyles, oversized eyeglasses, old style cabs, etc. 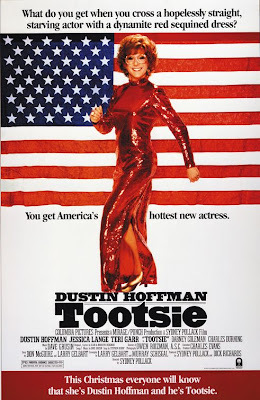 Besides, if anything at all, you'll leave with perhaps a greater respect for Dustin Hoffman as an actor! Well, back to food talk... for the picnic before the movie, I prepared these Southwest Chicken Rolls. They were something I concocted using what I had on hand and they turned out flavorful and light. Next time I make this I will probably roll them a bit tighter so they don't fall apart. I did find that chilling them for a bit before cutting helped to keep its shape. As you may have seen from this week's 'Tattle Tasters' recipes using wraps, it's just another way to serve wraps and you can fill tortillas with whatever you'd like! If you'd like a bit of heat, add a chopped jalapeno and/or some chipotle seasoning. Chop your chicken breasts into small chunks and place in a large bowl. Add the remaining ingredients except for the tortillas into the the bow; stir to fully combine. If needed, heat your tortillas either in a hot skillet or microwave, just enough to make them pliable. Spead a few tablespoons of this filling over one side of a tortilla. Carefully roll up the tortilla into a log - the tighter, the better. Don't worry if it doesn't look like there will be enough filling. Place the roll seam side down on a platter and repeat with the remaining tortillas. Cover the rolls with plastic wrap and chill for a few hours. You can make this in advance easily. When ready to serve, cut off the ends of the roll and set aside to eat later if you want. Cut the roll into 1 inch slices and secure with toothpicks to prevent them from falling apart, if needed. Serve as is! To go along with these southwest chicken rolls, I also made a salsa verde guacamole. To make, scoop out the flesh of 4 ripe avocados and combine with 1/2 cup jarred salsa verde, 1/4 cup halved grape tomatoes, 1 tablespoon of cumin, and juice of 2 limes in a bowl. Mash up the avocados and incorporate the ingredients together. Season with salt & pepper to taste. Tuesday was so much fun...I'm a bit disappointed that it was my first and last of the season, and now we have to wait until next June! joelen! Those look so yummy! DH would absolutely love them! And that salsa verde guacamole looks really good too! I can't wait to try them! Thanks for posting! what Italians think about American food. I told myself I wanted to do a movie in the park this summer, and never made it to one :( But these wraps look yummy, and could be a good part of any park picnic dinner! Man these look good! One of my favorite things to do with food I really love is pair it with a palette pleasing drink. Mixed Drinks Made Easy! offers hundreds of drink recipes that you can pair with your favorite foods for a real celebration of flavor!